Memories by AmyInKy: Oh crop! 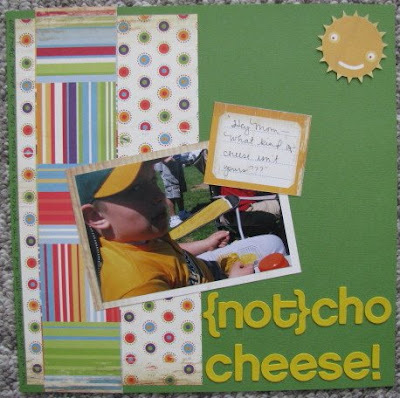 Personal Scrapper hosted an online crop that ran from National Scrapbook Day to Mother's Day. I was able to finish all 15 challenges and the 4 extra challenges posted during the week, too. It was a productive crop! I mixed the March PS kit with a Jenni Bowlin journaling card for this page for Blake's album. I rarely get pics of him with me anymore, so I was excited to use this one for the "favorite photo" challenge. Erica, the owner at PS, sent out a great PDF of LOs using the March kit with layouts by both DT members and kit club members. One challenge was to scraplift one of the layouts from that PDF. I lifted a LO by Star. I turned her LO on it's side and added an extra photo. Love this page! Thanks for the inspiration, Star! I thought the "definition" challenge would be a hard one until I realized my 7gypsies sticker sheets had definitions on them. The color scheme for some appropriate ones to use with this photo of Blake with Uncle Terry and Olivia (wacky, friend) matched some new Bella Boulevard "Family" papers I'd picked up on a recent trip to Henderson. LOVE, LOVE, LOVE how this one turned out. I loved using a sketch made by fellow PS member Sheila/smayden. It worked great with these pics of the boys playing on the go carts and motorcycles in front of the local Tractor Supply! I fell in love with Cosmo Cricket's new Snorkel line when it debuted at Winter CHA. I was thrilled to receive a few sheets from Paige R. when I won a RAK at PS. But, I still ended up buying the whole line with a coupon at Archiver's, too. The line worked great with our slip & slide pics from last summer and for the "summer's coming" challenge. There was an "alphabet soup" (mixed title) challenge that also worked with Snorkel. And Snorkel is good for non-water pics, too. I used it on "a fun tie?" and no, that's not a typo. Look closely...crazy Kev is wearing a tie while riding his bike! This challenge was to lift another LO I'd completed previously. I lifted a page I'd completed during the Slice challenges. I also made a page with similar photos for Blake's album. This challenge was to use 3 different paper manufacturers. I used 4. Erica asked me to post a challenge during the crop. I decided to ask everyone to make a page that used a "play on words." 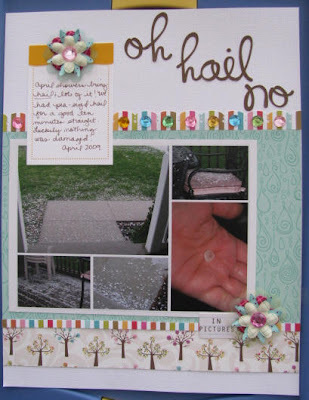 I posted "oh hail no!" for my example. Whenever I read this title, I say it in my best Jerry Springer guest voice complete with head bobbing and finger waving. (And, no...I'm not a regular viewer!) The photo collage was of a recent April hail storm we had - that lasted ten minutes! Luckily we had no damage. I also completed a second layout for my own challenge with this shot of Blake at baseball's opening weekend. We take our "cheese & chips" very seriously, and us Wheelers DO NOT like to share. Yes, if looks could kill (see photo below)... Needless to say, we've taken to calling nachos "NOT-CHO" cheese! (And this LO uses the Snorkel line, too.) Another challenge that stumped me was the black and white challenge. When I looked through my possible paper options, the letter paper reminded me of a photo I'd filed away of Kevin's journal. And so...a layout was born. Snorkel made another appearance in the "monochromatic" challenge. The "Cinco de Mayo" challenge was to use red, green and white. I decided to make a Christmas layout. I got to use some of the new Basic Grey Lime Rickey papers on a page for Kevin's album. These shots were from last summer. The page is simple, but I liked all the bright colors. I completed the Mother's Day challenge by making a mini album for my mom. 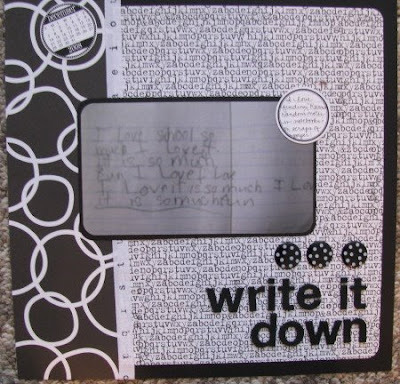 I used a $1 chipboard heart shaped album from Michael's and the Scenic Route Sonoma line of papers.